Alice married Arnold Behnke February 23, 1952, at St. Mary’s Catholic Church, Crivitz. Alice loved Arnold the day he rode up to her on his horse to ask her on a date. Her love and commitment to Arnold included raising 8 strapping boys and one beautiful daughter, a feat all by itself. This love extended to her children, grandchildren, great grandchildren and extended family. Alice worked for Frigo Cheese for years, as well as driving a school bus. Sports were also central to the family, and Alice was always happy to lend a hand. At countless Beaver Falcons and Kabby’s Nailers softball games you could find Alice “keeping the book.” Alice kept her husband organized, maintained the mountain of research he compiled, and acted as a sounding board for his many editorial letters. Her commitment to her family included being involved with horses, specifically barrel racing and parades. She once said, “I don’t like the horses, but I love the man.” Through all of this Alice was a constant uplifting presence and gracious hostess to any and all who visited AA ranch. Friends often stopped by for a cup of coffee, a smile, and hug to go. Alice loved life, laughter and sharing stories that would bring joy while giving encouragement and support whenever needed. When Alice wasn’t supporting everyone’s life, she could be crocheting another lap blanket for a grandchild or quite possibly painting. Surviving are eight children: Arnold Jr., Bolivar, MO; Alan (Ruth), Oconto, WI; Gary (Julie), Hartford, WI; Glen, Crivitz, WI; Jon (Linda), Crivitz, WI; Joseph (Bonnie), Fredericksburg, VA; Paul, Crivitz, WI; Robert (Anna), Bolivar, MO; 33 grandchildren, 21 great-grandchildren, and 5 great-great-grandchildren; one sister, Carol Reichardt, Crivitz; and 3 brothers, Jerry, Denver, CO; Bruce, Romeoville, IL; and Alan, Burbank, IL. Alice was preceded in death by her husband, Arnold; her daughter, Patsy; one brother, Richard and 2 grandchildren, Jenice Ruth Eastman, and Britta Sorenson. Family will greet relatives and friends Saturday May 4 at the Rhodes-Charapata Funeral Home in Crivitz from 9 a.m. until going to St. Mary’s Church at 11 a.m. for Mass of Christian Burial Rev. Fredrick Sserugga officiating and burial in the Church Cemetery. To send flowers or a remembrance gift to the family of Alice Frances Behnke, please visit our Tribute Store. 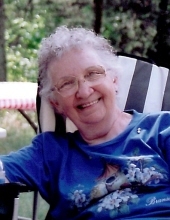 "Email Address" would like to share the life celebration of Alice Frances Behnke. Click on the "link" to go to share a favorite memory or leave a condolence message for the family.